SEIA reports 600,000 installed solar systems currently in the U.S. and expects that number to reach 3.3 million by 2020. While it’s great to see this green source of power taking off, there are challenges to that growth, especially at the utility level. The electric power grid was designed to deliver power from the utility to the user while surplus power from customer-sited projects flows the other way—from the solar system to the utility. This is called backfeeding. The grid can handle backfeeding, but how much depends on the age and complexity of the grid equipment. As more solar projects come online, more power flows back to the utility than is needed, which raises concerns for grid operators tasked with matching the supply with the demand. There is already a component smart enough to help solar projects get along with the grid into the future: the inverter. The inverter’s job is diverse and will include even more duties to support the smart grid of the future. In addition to controlling its own output, it will be asked to provide reactive power support for the grid, which will improve grid stability and efficiency. It will also interface with a utility operator’s SCADA system, have the ability to be controlled dynamically and remotely and provide diagnostic information to aid operations and maintenance crews in identifying and remedying system issues. Are inverters up to the task? These “smart” inverters can also now be paired with energy storage for a more comprehensive solution that helps stabilize the grid. “Though there are battery-based inverters with grid management functions such as peak shaving and ramp rate controls, the cost of storage remains a barrier for its widespread adoption.” Still, the benefits of energy storage systems to the grid­—such as reduced peak demand and decreased heavy shifting—makes finding a cost-effective way to incorporate this technology important. Like solar, storage technology is rapidly evolving and the market is expected to soon see smaller, more affordable commercially available solutions. 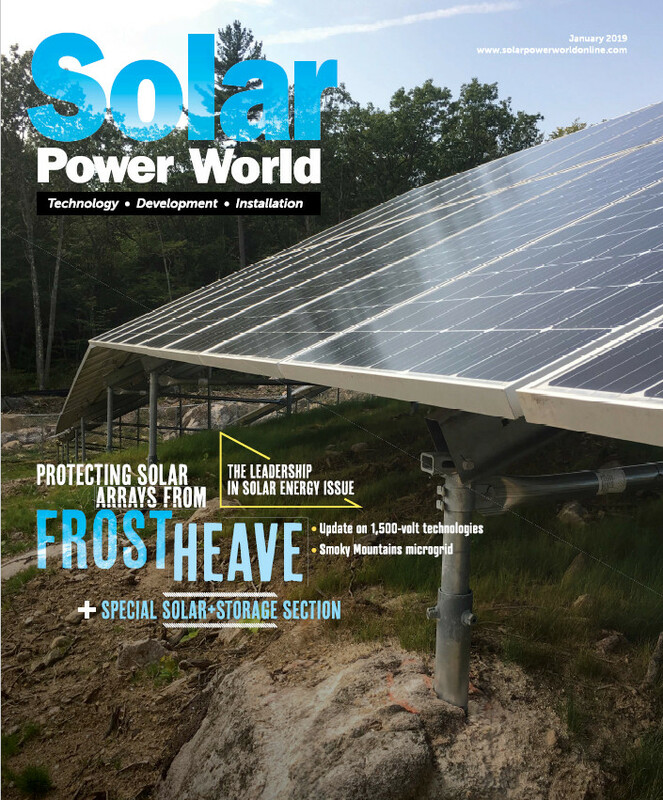 Soonwook Hong, power systems engineering manager at Solectria-A Yaskawa Company, explained that many inverter manufacturers can include grid management functions with minor software changes or firmware upgrades. Hong is supportive of inverter grid support functions, saying they are crucial to promote renewable energy usage. He also shares considerations about their effect on parties involved and on the inverter itself. Hawaiian Electric Company (HECO) has been among the first utilities to set grid standards for solar in the United Sates. Hawaii’s high solar penetration level (12%), older grid technology and limited size originally proved problematic for HECO, which barred adding new solar installations for a short time. After orders from the state and further research into how updates to circuits and meters could allow the grid to handle more than first thought, the utility is working to approve its backlog of projects. It has set guidelines for grid interaction, including a published list of inverter equipment that will work on the grid. California has had its share of issues because it currently has more grid-tied PV than any other state. To solve them, the California Public Utilities Commission (CPUC) is reviewing Rule 21, while includes interconnection, operation and metering regulations for connecting distributed generators (solar plants) to a utility’s electric system. The Smart Inverter Working Group (SIWG) is responsible for establishing inverter functions to comply with the rule. LeBlanc expects the standards developed by this group to likely be adopted by other states. Hong said with 3,000 utility companies in the United States, it’s not easy to set or meet requirements, but it is a must to earn utility support of solar on the grid. Active power curtailment: The adjustment of a resource’s active power in various response timeframes to assist in balancing the generation and load, thereby improving power system reliability. When solar produces too much (as established by grid operators), the inverter increases PV voltage to reduce the power output of the array. Reactive power control: When voltage and current aren’t in-phase, you get reactive power that moves back and forth in the grid. This power can help grid operators regulate voltage on a timeframe of hours or days. Through SCADA systems, utilities can tell the inverter how much reactive power to let into the grid. Power factor control: Inverters can set the ratio of reactive power to active power, on a cycle to cycle of the AC line, to help maintain voltage. Voltage ride-through: Inverters can help maintain solar plant operation through periods of lower grid voltage to avoid having to disconnect, which causes a chain reaction of other plants disconnecting due to the dip in voltage, known as cascading. This helps keep the grid stable. Frequency ride-through: The inverter can help keep the solar plant from disconnecting from the grid during time of high or low variations in frequency, determined by regulatory requirements, therefore aiding grid stability. Ramp-rate controls: The inverter can control the rate at which it transitions between different established power factor points. This ensures the plant output does not ramp up or down faster than a specified limit. Energy storage technology can add or subtract power to or from the PV output to smooth out the high frequency components of the PV power. More information on smart inverter grid functions is available from the Electric Power Research Institute at epri.com.